We're proud of the food grade, organic and naturally derived ingredients we use in our products. Each ingredient in our formulas serves a specific purpose and has been selected based on properties, benefits, source and extraction methods. Many of the ingredients and processes we use date back thousands of years. We've incorporated them into our xenoestrogen-free products to bring you the most natural and purest skincare, bodycare and household cleaning product lines on the market today. In this section we feature the main ingredients and processes we use that set Zero Xeno apart from other brands. 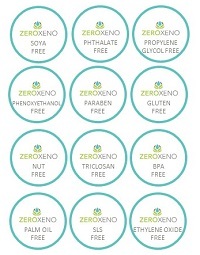 If you are interested in knowing the exact ingredients used in each individual Zero Xeno product be sure you click on the ingredients tab located on the product pages at our online store. Learn more about your product choices before you purchase. Become an informed consumer and feel empowered as Zero Xeno endeavors to educate and assist you and your family in the quest to live a healthy xenoestrogen-free life.